If you’re a fan of Anthropologie and their line of home decor accessories you appreciate their value they bring to your home. Unfortunately, most of the things you can buy in the stores are quite pricey, even the most trivial things. But have you ever thought that you could make some of those accessories yourself and they would look none the worse than the real thing? We have collected a bunch of DIY Anthropologie hacks and now you can make your own decor accessories at a fraction of the cost. Make this awesome table lamp with faux paper mache technique. Works great if positioned on a side table next to a sofa. It’s easy to embellish a table DIY lampshade – see it for yourself and it won’t cost you much at all. Another whimsical Anthropologie knockoff lamp you can make yourself from old china. This compact bookcase has great decorative value and you don’t even have to buy one. Check out the tutorial to make one yourself. Reclaimed wood letter art is a great decor feature for your walls, it adds that warm rustic touch but it can be surprisingly expensive. Not if you make it yourself. These stacking trays are great to solve storage problems of small things and you can have them at a fraction of cost. Start building them now – check out the tutorial. Weathered furniture is a trendy way to add that rustic chic style to your home and you don’t have to break the bank to acquire it. Make one yourself with this tutorial. This rack is whimsical as much as it’s useful and it’s a great addition to your kitchen for hanging towels. This beautiful DIY lantern will add a cute accent to your garden or backyard and it’s much easier to make that you think. Add this whimsical accent to your bookcase displays. Hang this cute ceramic chalkboard on the wall to take notes. All it takes is a cheap plastic toy to make this door stop and it costs just a fraction of the real thing. Want to add some rustic chic style to your vanity? Make this distressed mirror. You’ll need some old brass lighting fixtures for this project but the end result is worth looking for them. Rolling furniture is great for small spaces and you can make one in rustic style too. Copy the style of these handsome black and white hanging hooks. 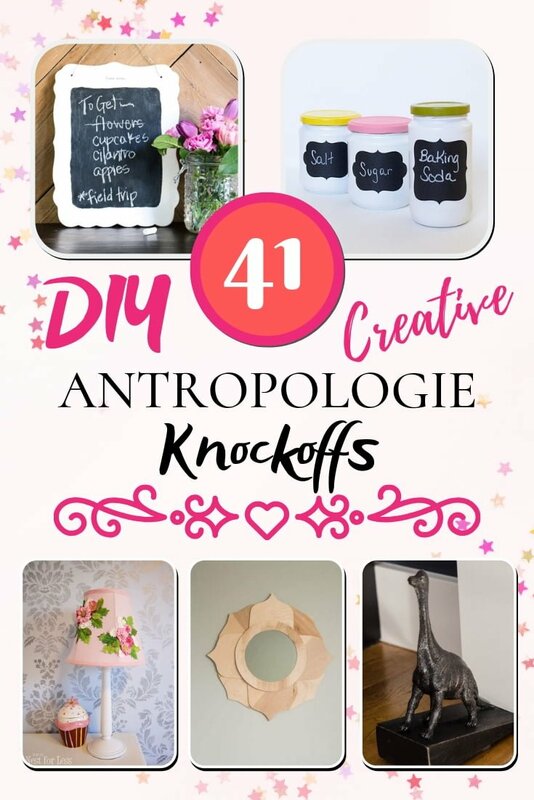 This tutorial shows you how to make an Anthropologie knock off for under $10 and have a piece of statement art at a fraction of cost. Having chalkboard for spice jar labels is ingenious and the best part is you can make it yourself. It’s whimsical and would make a great feature on display, and you can make it from a cheap plastic toy. Home decor accessories can cost a pretty penny and more often than not they already look like a DIY project. So why not make the real thing at a fraction of cost? This Anthropologie accent mirror that costs $400 was made for under $15. This tassel pillow makes a great accent for decorating a sofa or a chair. Follow the tutorial to make one (or two). Use much cheaper bed sheets to make these gorgeous curtains. The whole idea of these gorgeous planters is that they’re hand crafted, so it only makes sense to make them yourself rather than buy in stores. For more whimsical accents take a look at these candlesticks and consider making some yourself. Rustic accents have never been so easy to add to your decor and you can do it yourself. These coasters look absolutely stunning and you can have them for your home – just follow the tutorial. These whimsical jewelry boxes aren’t just for keeping jewelry, they make wonderful display items too. If you’re looking for accent pillows to decorate your home, these pom pom pillows will certainly do it. If more whimsy is what you’re looking for to add to your home decor, this chalkboard globe will bring lots of it. Making this gorgeous dresser might be a more involved project but it’s all worth it. Get this farmhouse table by avoiding the exorbitant price tag. Your desk needs some glamour and this is one way to add it. This organizer is useful in many ways, both to solve storage problems and as a decor feature. Make this fuzzy pom pom yarn wreath to decorate your home during the season (and not only). Nautical themed accent mirrors that you can easily make yourself. A truly wonderful way to decorate the walls. Get the look of these attractive flutter curtains. Bring some chic style to your kitchen with these dipped wood utensils that you can easily make yourself. This pretty pipe lamp will bring more whimsy to your decor than you’ll ever need. Brilliant in their simplicity these cute fuzzy pom pom dandelions will serve you well in adding little accents around the house. Take a couple of plain white bowls and transform them into art with just a little craftiness.